French fries, who doesn’t love this food? I believe you also do, which is the reason you are reading this piece. Most of us not only love this snack because it is delicious, but it is also easy to prepare. The only difficulty you can face while making this dish is when you need to cut the fries manually while trying to shape them evenly. For this reason, several manufacturers have come up to make french fry cutters to help you produce even french fries from you potatoes with a lot of ease. Hence, this makes it difficult for you to select the best potato cutter from the many brands available. Preparing french fries does not have to be tiresome and time-consuming. With this french fry cutter, you can be sure to have perfect slices of potatoes with little effort. You will only need to place the potato on the press, push down the handle, and there, you have your uniformly sliced pieces. This product features a heavy-duty cast iron construction. What does this mean? No more wastage of money purchasing french fry cutters due to regular breakages. Even better, it features stainless steel blades. These help to enhance durability while you will no longer deal with rusting and corrosion. What’s more is that you can forget about having your french fry cutter sliding while in use. The reason behind this is that it features suction cup feet aimed at giving your device added stability. Another plus of this machine is that it gives you the option to use it while on your countertop or when mounted to reduce the clutter on your working space. 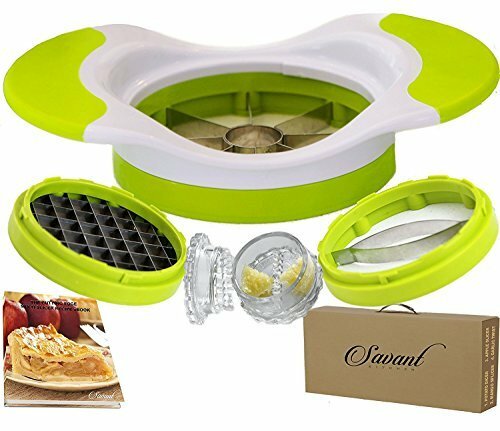 With this equipment, you will not only slice your peeled potatoes, but you can also try them unpeeled, seasoned or unseasoned as well as baked or unbaked. Even better, you can use it on carrots, sweet potatoes, and eggplants, among other vegetables. This french fry cutter will slice your 6″ potato into 3/8″ french fries. Just as the name suggests, this french fry cutter is constructed to allow you to perform heavy duty tasks without the fear of it breaking. The device features a solid aluminum alloy construction with cast iron rod, which makes it highly durable. More to that it features three size wedge blades and pusher blocks. The blades with sizes of 1/4″, 3/8″, 1/2″ enable you to choose the size of the french fries you want to deliver. What’s more is that these blades feature a stainless steel construction to safeguard your health since they do not corrode or rust. This french fry cutter is ideal for home or commercial use since it is comfortable to use. Its handle is elegant and ergonomic featuring non-skid and easy to grasp features. As such, you can remain comfortable through long cutting hours. Even better, the various blade sizes make it perfect for commercial uses since you can cut thin to thick fries. Once you get one of these cutters, installing it is easy, and you can base it on your preference. You can use the four heavy-duty suction feet to install it on your smooth countertops so that it does not skip. On the other hand, you can mount it to your wall permanently for enhanced effectiveness. What’s more is that all accessories are included to make fixing much easy. 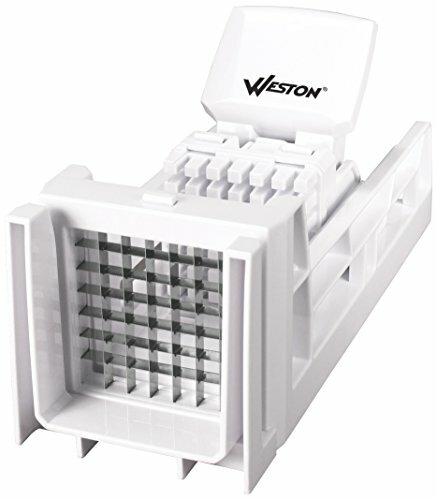 Do you in need of a heavy-duty french fry cutter that will give you the ability to deliver different sizes slices? This french fry cutter by best choice products is one of the best products to give a try. It features heavy-duty stainless steel blades that are aimed to enhance durability. Stainless steel blades also deliver safe slices since it is resistant to rusting. This device features three french fry blades and a fourth blade designed for slicing oranges and apples. The three blades deliver slices that measure 3/8″, 1/2″, and 3/4″. As such, you can use it to produce thin to thick slices based on your preference. 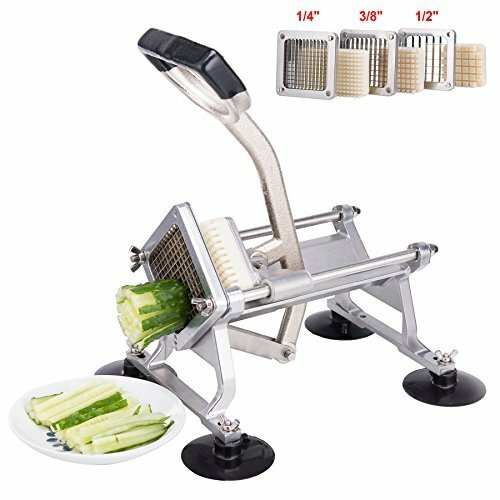 While cutting your vegetables using this machine, you may mount it on the wall or the table. 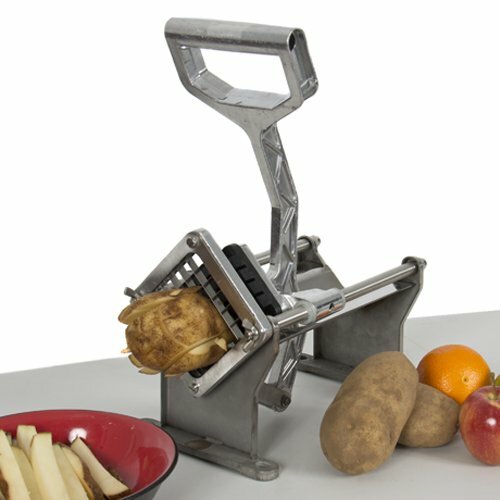 Do you want a potato slicer that will not only cut your potatoes but other vegetables too? You should give this french fry cutter a try. 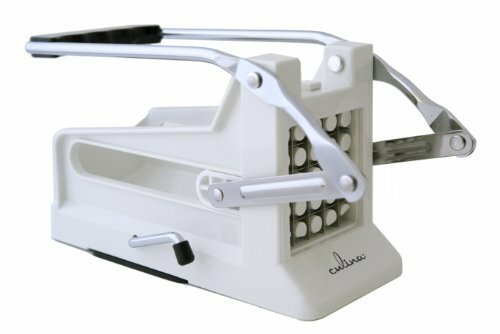 It is a versatile potato cutter that will help you to slice your yams, carrots, eggplant, zucchini, apples, and turnips, among other vegetables. As such, no more cutting of fingers trying to chop your fruits and vegetables. Apart from enabling you to cut various vegetables, this potato cutter will let you cut them the way you like. This is because it features four interchangeable blades that cut different sizes. So, if you prefer thin or thick slices, you can be sure to get what you want while using this cutter. What’s more is that you will have your preferred slices with little effort. This is due to the extra long lever that offers maximum strength power. With this machine, you can be sure to produce slices that are not a threat to your health. The reason behind this is that the blades are of stainless steel to ensure that they do not rust or corrode to avoid leaving metals to your foods. Even better, these blades make it easy for you to clean them thereby enabling you to stay healthy. 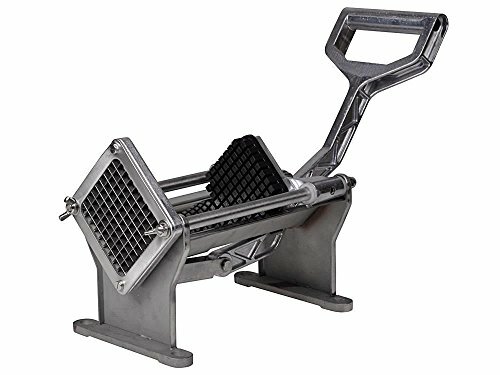 The TMS® Potato French Fry Cutter can give you a long service time since it features an aluminum alloy steel handle that will not break no matter the pressure you exert. Even better, the stainless steel blades are durable to prevent them from breaking. The fact that the overall frame construction is rust proof also adds to its durability. 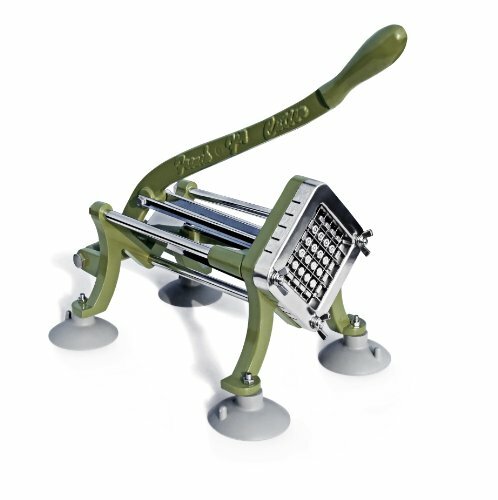 This potato slicer from New Star is built to last since it comes with a heavy duty rust proof powder coated iron body. As such, you can be sure that it will endure all forms of abuse, including leaving it leaving outside. What’s more is that this potato slicer features a stainless steel rod that will enable you to slice your vegetables with little effort. The slicer can cut your vegetables into 1/2″ pieces, which is a perfect size to make your food look presentable. You can use this slicer while mounted on the table top or the wall. What’s more is that it comes with powerful suction feet for easy mounting. Once you do not want to use this french fry cutter, you can remove it from the mounting area with a lot of ease. This potato slicer by TigerChef company ranks among the best french fry cutters due to its reliable operation. It features all metal cutters, a cast iron body, and a stainless steel rod, which makes it a heavy-duty slicer. As such, you can use it to slice lots of vegetables such as fries, zucchini, among others into uniform pieces, which make it suitable both for commercial and home use. This heavy-duty potato slicer features three sizes of super sharp blades. These enable you to cut through your hard vegetables such as sweet potatoes with a lot of ease. When using it, you only need to push the handle and observe as your vegetables get sliced by the sharp blades. Another plus of this french fry cutter is that it has convenient suction feet. These allow you allow you to mount your slicer on the countertop or the wall so that you can be sure to deliver best slices with little effort. The feet can be detached once you are done using your slicer to leave a clutter-free kitchen space. Once you get one of these, you can be sure to have an easy time maintaining it since it features 1/4″, 3/8″, and 1/2″ replacement blades and block sets. What’s more is that its package includes suction feet so that you do not have to buy them separately, and a free cleaning brush to help maintain your potato slicer clean. Have you been looking for a potato slicer that you will clean at a breeze? If so, you should not hesitate to try this french fry cutter. Once you need to clean it, you can simply need to put it into your dishwater and let the cleaning be handled for you. This Weston french fry cutter will serve you for long. It features a high-quality ABS plastic body that will not break easily. What’s more is that the slicer will enable you to cut differently sized vegetables since it includes 3/8″ and 1/2″ blades and pusher. As such, you can be sure to get your perfect sized vegetables. What’s more, this slicer allows you to dice with little effort. It includes a removable knife guide that will enhance even vegetable dicing. 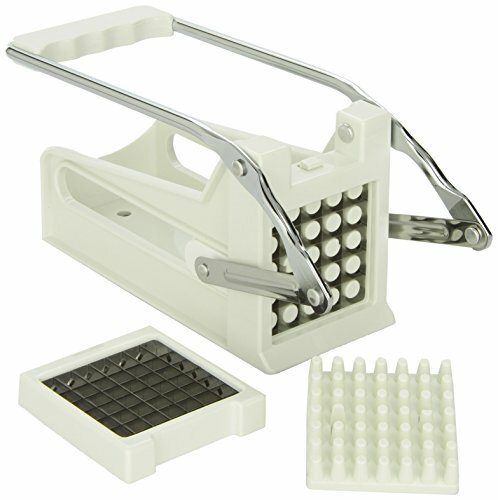 When slicing or dicing, this potato cutter will not mess since it will remain stable due to its non-slip rubber feet. This potato slicer features a design that will enable you to cut your vegetables with a lot of ease. It is curved at the lower part to let you have a simple time while fitting potatoes before cutting. What’s more is its interchangeable blades that deliver two size cut options. As such, you can get thin slices or regular sized slices based on your preference. Something more about this slicer is that it not only gives you the chance to cut potatoes only but other vegetables too. As such, you can be sure to slice your radishes, cucumbers, and apples, among other vegetables. Once you have cut your vegetables, you can be sure to clean the potato cutter with a lot of ease since it only requires spraying of water in the areas with food residue. The Prepworks is the answer to your french fry cutting needs when you want a potato slicer that will enable you to slice lots of french fries within a short time. It can easily create dozens of french fries with a single push of a lever. This is because of the interchangeable stainless steel blades, one with 25 holes and the other with 49 holes. As such, when you want to create 3/8″ fries, you can use the 49 holes blade, while you can use the 25 holes blades to create 1/2″ french fries. What’s more is that the cutter features a soft handle that leaves you comfortable at the end of it all. Operating it is simple since you only require to place your potatoes into the chute and push the lever, after which your work is done. Once you finish slicing the potatoes, you can only hand washes your machine since it does not support the use of dishwashers. You can also use it when you need to cut your carrots, cucumber, and zucchini. 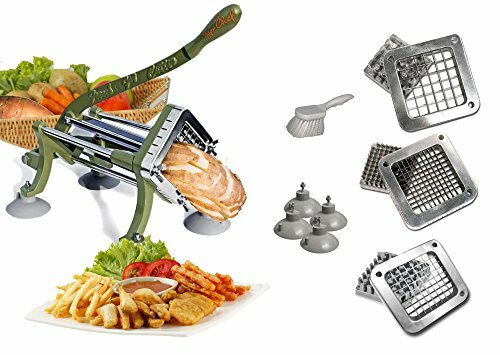 Despite it being in the bottom of the best french fry cutter, this vegetable slicer has a lot to offer which therefore makes it be among the top 10 potato cutters. The slicer does not only slice your vegetables into eight perfect slices but also removes the core simultaneously. It features easy grip handles, which are also large and cushioned to give you the comfort you need when using this slicer. What’s more is that its blades are of stainless steel and they are sharp, so that you do not have to exert a lot of pressure while slicing your vegetables. Once you use this machine, you can clean it using your dishwasher. It is perfect for use on apples, mangoes, pears, and potatoes. You need to look for potato slicer with a material that will fit your duties. So, you will have to determine if your potato slicer is one to perform heavy-duties or low duties. If you need a potato cutter that you will use on a daily basis to cut significant amounts of french fries, ensure that it has a rugged frame and cutting mechanism. It should also feature an ergonomic handle that will leave you comfortable after a long time of use. On the other hand, if it is one that you will need to use at home, it does not have to be very strong, but it should at least endure your home slicing duties without breaking. How sharp are the blades? Do you have to sharpen them after every use? Are they removable to make it easy to wash your machine? Are the blades rust proofs? There are a lot of questions you need to ask before purchasing a potato slicer. Whatever your concern is based on the cutting mechanism, ensure that the french fry cutter you select has that provided for. 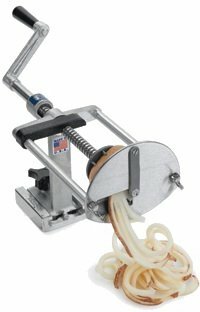 What is the method of mounting that your potato slicer applies? You will need to answer this based on the comfort it will give, as well as the space you have available. For instance, you may have a countertop that is quite high for your height, and thus prefer the one that you can mount on the wall. On the other hand, you may have a working surface that is not big, and to avoid cluttering it, you may decide to consider a wall-mountable slicer. So, determine this too before spending your money. Also, ensure that the slicer features nonslip feet or at least suction cups so that it remains stable while using it. 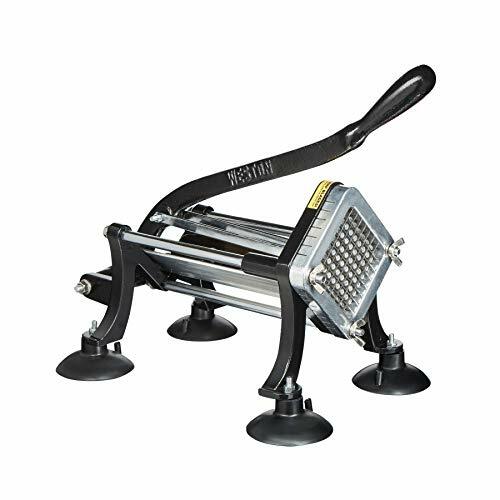 What method of cleaning does the potato cutter support? Some are dishwasher safe while other requires that you hand wash.
As such, determine how easy it is to clean your french fry cutter. After all, this is something that you must do after every use, and you do not want to have a difficult time doing it. So, determine this too. What is the warranty offered by the manufacturer on the parts of your slicer? You do not want to purchase a french fry cutter, only to find out that once it breaks down, you have to keep spending to get a new one. Find out about the customer care follow up so that you do not have a difficult time in case of a misfortune. Apart from the considerations above, other factors that come to play when selecting your potato slicer includes the slicing shape, weight, vegetables it can cut, the cost, among others. These factors depend on your preference, as well as your budget. So, check on these factors too before determining the amount you will spend on the french fry cutter. I hope that you now have what it takes to make the best choice when you want to purchase your potato slicer. Remember, the satisfactory features that the french fry cutter includes should be your priority and not the price. So, be sure to consider the features first among the potato cutters you come across, and more importantly, you can consider one of the products reviewed here for the best value for money. Useful article on choosing a french fry cutters. I excited to see this informative article post. Last few days I am looking a purchased a french fry cutters for my mom. But I don’t get perfect guideline. This article is informative, and it is best for purchasing.